LOUDON, N. H. – William Byron stole a page from his mentor and team owner, Kyle Busch. 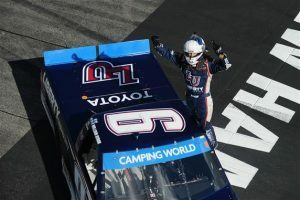 Leading 161 of 175 laps in Saturday’s UNOH 175 at New Hampshire Motor Speedway – the first race in the inaugural NASCAR Camping World Truck Series Chase – Byron cruised to victory, the way Busch has done so many times before, and punched his ticket into the Chase’s Round of 6. Not that runner-up Christopher Bell, Byron’s stablemate at Kyle Busch Motorsports, didn’t make it interesting in the closing laps. As Byron worked traffic in the late going, Bell closed from 1.325 seconds behind with five laps left to .430 seconds down on the next-to-last lap. But Bell ran out of time and crossed the finish line .446 seconds behind his No. 1-seeded teammate, who won for a series-best sixth time. “I wore myself out passing some lappers,” Byron said. “But with the amount of laps we had left, I thought I’d be OK. I was afraid the 4 (Bell) was going to catch us there at the end. We started to get tight, but that’s what happens sometimes when you get out front. Two-time series champion Matt Crafton came home third, followed by Tyler Reddick and Timothy Peters. With the Chase field to be trimmed from eight to six drivers two races hence at Talladega Superspeedway, Ben Kennedy and Daniel Hemric fell below the provisional cut line. Kennedy finished 11th and trails Johnny Sauter (10th on Saturday and sixth in the standings) by one point. If Kennedy’s result was only mildly disappointing, Hemric’s was a catastrophe. With his left rear tire cut down to the rim, Hemric spun in Turn 1 on Lap 25 to bring out the third caution of the race. His truck suffered a cut brake line and consequent fire in the left rear wheel well. Hemric lost 33 laps under repairs, finished 28th and fell to last in the Chase standings, 21 points behind Sauter with two races left in the Round of 8. In all probability, Hemric will have to win one of those two events, at Las Vegas and Talladega, to advance to the Round of 6. After leading the first 54 laps, Byron lost the top spot briefly when Cody Coughlin stayed out under the fourth caution and Bell, Kennedy, Crafton and Spencer Gallagher leap-frogged ahead of Byron with two-tire and fuel-only calls in the pits. But Byron regained the lead from Bell on Lap 69 and held it the rest of the way. As Bell gained ground in the final laps, Byron was trying to save his equipment to prepare for a possible late caution. Byron leaves New Hampshire with a 16-point lead in the standings and guaranteed admission to the next round of the Chase. Crafton (+11 points above the cutoff line) is second in the Chase standings, followed by Bell (+10), John Hunter Nemechek (ninth on Saturday, +5), Peters (+3), Sauter (+1), Kennedy (-1) and Hemric (-21). 1. (1) William Byron #, Toyota, 175. 2. (3) Christopher Bell #, Toyota, 175. 3. (7) Matt Crafton, Toyota, 175. 4. (4) Tyler Reddick, Ford, 175. 5. (2) Timothy Peters, Toyota, 175. 6. (14) Cole Custer #, Chevrolet, 175. 7. (9) Kaz Grala, Chevrolet, 175. 8. (6) Brett Moffitt, Toyota, 175. 9. (15) John H Nemechek, Chevrolet, 175. 10. (10) Johnny Sauter, Chevrolet, 175. 11. (12) Ben Kennedy, Chevrolet, 175. 12. (17) John Wes Townley, Chevrolet, 175. 13. (19) Stewart Friesen, Chevrolet, 175. 14. (18) Spencer Gallagher, Chevrolet, 175. 15. (5) Ben Rhodes #, Toyota, 175. 16. (20) Ryan Truex, Toyota, 174. 17. (21) Rico Abreu #, Toyota, 174. 18. (31) Travis Kvapil, Chevrolet, 174. 19. (8) Cameron Hayley, Toyota, 174. 20. (16) Cody Coughlin #, Toyota, 173. 21. (25) Tommy Joe Martins, Chevrolet, 172. 22. (23) Jordan Anderson, Chevrolet, 171. 23. (24) Matt Mills, Chevrolet, 171. 24. (27) Alon Day, Chevrolet, 171. 25. (28) Jennifer Jo Cobb, Chevrolet, 170. 26. (29) Timothy Viens, Chevrolet, 160. 27. (26) Josh Wise(i), Chevrolet, Accident, 147. 28. (13) Daniel Hemric, Ford, Brakes, 127. 29. (22) Austin Wayne Self #, Toyota, Accident, 126. 30. (11) Austin Hill, Ford, Oil Line, 105. 31. (32) Akinori Ogata, Chevrolet, 75. 32. (30) Caleb Roark, Chevrolet, Accident, 0. Average Speed of Race Winner: 95.343 mph. Time of Race: 01 Hrs, 56 Mins, 31 Secs. Margin of Victory: 0.446 Seconds. Lap Leaders: W. Byron # 1-54; C. Coughlin # 55-57; C. Bell # 58-68; W. Byron # 69-175. Leaders Summary (Driver, Times Lead, Laps Led): W. Byron # 2 times for 161 laps; C. Bell # 1 time for 11 laps; C. Coughlin # 1 time for 3 laps. Top 10 in Points: W. Byron # – 2,052; M. Crafton – 2,036; C. Bell # – 2,035; J. Nemechek – 2,030; T. Peters – 2,028; J. Sauter – 2,026; B. Kennedy – 2,025; D. Hemric – 2,005; C. Custer # – 369; T. Reddick – 363.